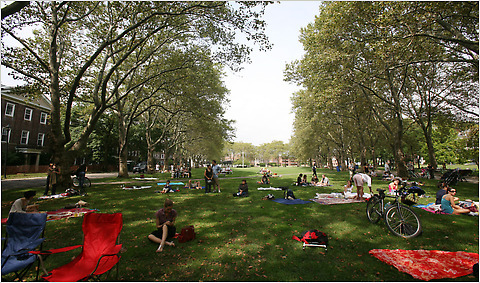 **I’m Director of Public Programs at Long Island City’s Socrates Sculpture Park. The 2019 season (May through October) of vibrantly diverse FREE public programs from outdoor cinema to yoga and tai chi to performance to dance to huge festivals to concerts to kayaking to art-making for kids & families and much MORE – will be announced in Spring 2019. *For a list of literary resources & happenings in Queens I started compiling in 2013, visit the QUEENS LIT RESOURCES page at tinyurl.com/queenslit! 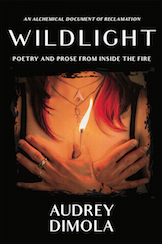 My third book of poetry and prose, “WILDLIGHT” was officially released on 3/20/18!!! For purchase and further info, please click HERE. Previous- curating, hosting, and volunteering with Astoria Music & Arts 2008-2009, in bloom collective (co-founded) 2011-2012 for festivals and multi-disciplinary arts events. Thursday, October 6th, a night of poetry and performance featuring New York City’s finest emerging talents. Featuring the poetry of: Paolo Javier, the Poet Laureate of Queens, Audrey Dimola, Advocate of Wordz, the host of the “Open Room” at the Nuyorican Poets Café, BOWWOW favorite Carina Del Valle Schorske, Sarah Feeley, and from New Haven, David Gorin, in addition to BOWWOW’s newest contributor, Nadia Parbo, and a special performance by musical guest, Tanya Betley. 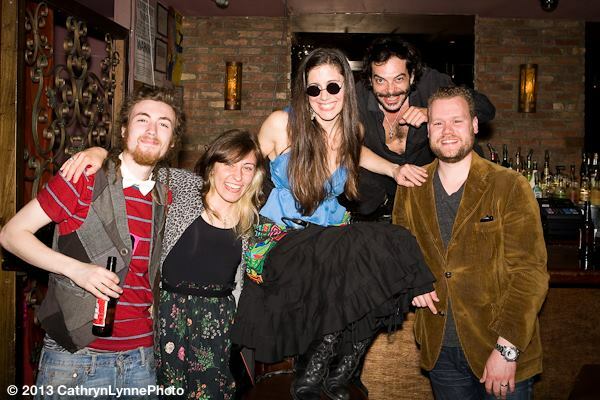 Audrey Dimola, Paddy Fitzgerald, Joseph Mulholland, Mike Stahl, and host Aida Zilelian-Silak. 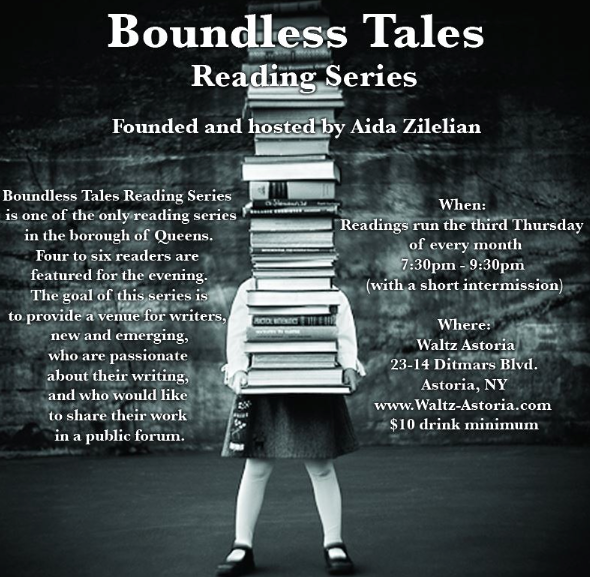 Boundless Tales is one of the only reading series in Queens – more on the reading and info on submitting your work here. Michael Alpiner, Robyn Burland, Audrey Dimola, Maddy Lederman, and Richard Marx Weinraub. 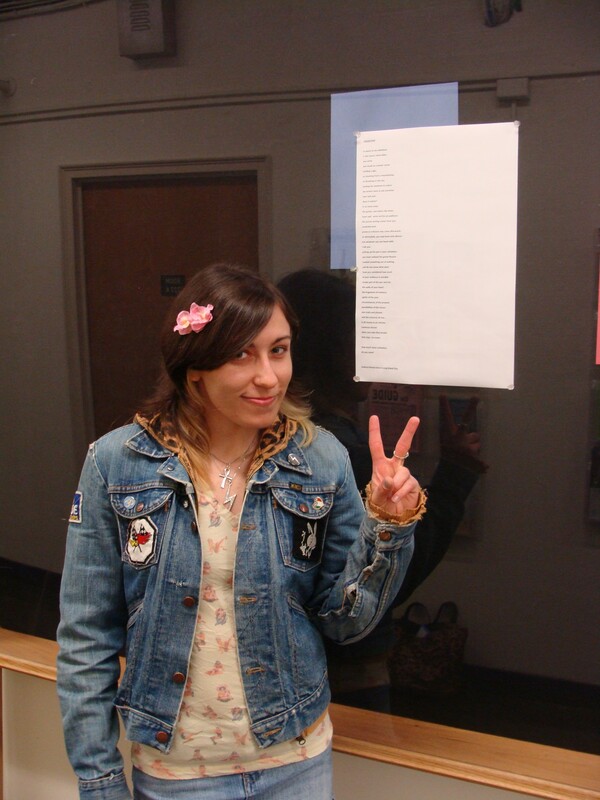 Not exactly a reading or performance, but I was thrilled to have my poem “validation” hand-picked for inclusion in the inaugural Queens Poets & Poems exhibition at Queens Borough Hall, curated by Queens Poet Laureate Paolo Javier for National Poetry Month 2012. Featuring my poem, “voyage.” Directed by Patrice Miller: An interdisciplinary exploration of the figure through performance text and sculpture using classical texts and new material from contemporary authors written in response to the process and work of artist Julie Tremblay. Featuring work from Marcus Bowers, Edward Einhorn, Audrey Dimola, Justin Maxwell and others, Some Kind of Nature focuses on the intersection between the real and surreal, the body and the idea of the body, drawing inspiration from classic surrealists and writers like Jorge Luis Borges. Ignas Bautrenas, Christian Diaz, Audrey Dimola (guest host & reader), Anthony Frisina, and Mickey Z.
Lisa Badner, Devin Doyle, Carrie Noel, Patrick Noyes, and host Aida Zilelian-Silak. Cassandra Trascik, Nathaniel Kressen, Audrey Dimola, David Moscovich, Cory Leadbeater, Adina Lepp, Siobhan O’Loughlin, and Kelly Wehrle share their work at LaunchPad from 8pm to 11pm (Renegade’s FB page is here). Performing an excerpt from Muriel Rukeyser’s play “Houdini” with The Believe Project as a site-specific poetry installation to welcome attendees to PARACHUTE: The Coney Island Performance Festival. Curated by Amanda Deutch and Becca Klaver. Parachute’s FB page is here. Invited by the Brooklyn Museum to reprise our Rukeyser performance (with even more pizzazz!) 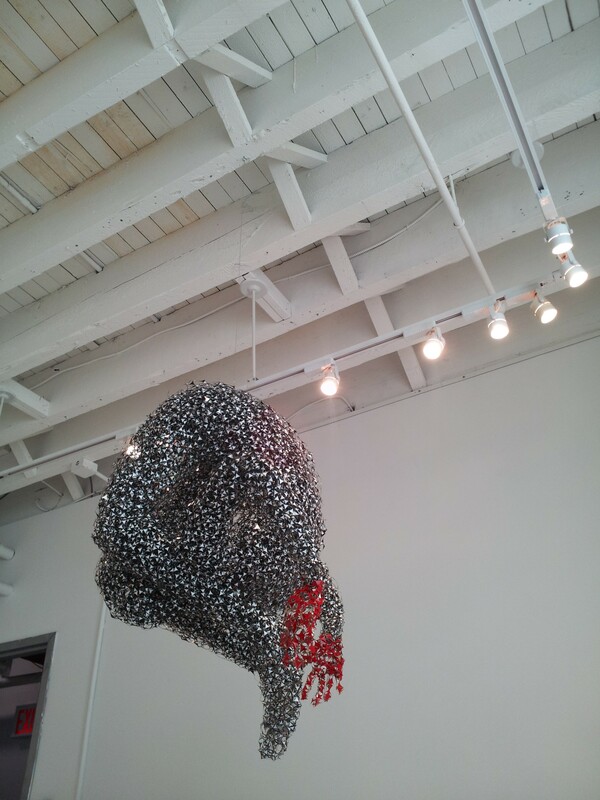 as part of their Target First Saturdays programming. So very cool! Parachute’s FB page is here. Storytellers, poets, comedians, performance artists and… glass eaters. Really? Yes. Hosted by Siobhan O’Loughlin and featuring: Martin Dockery, Todd Anderson, Audrey Dimola, Abigoliah Schamaun, Matteo Lane, and Eli Reiter. Honey and Poison’s FB page is here. 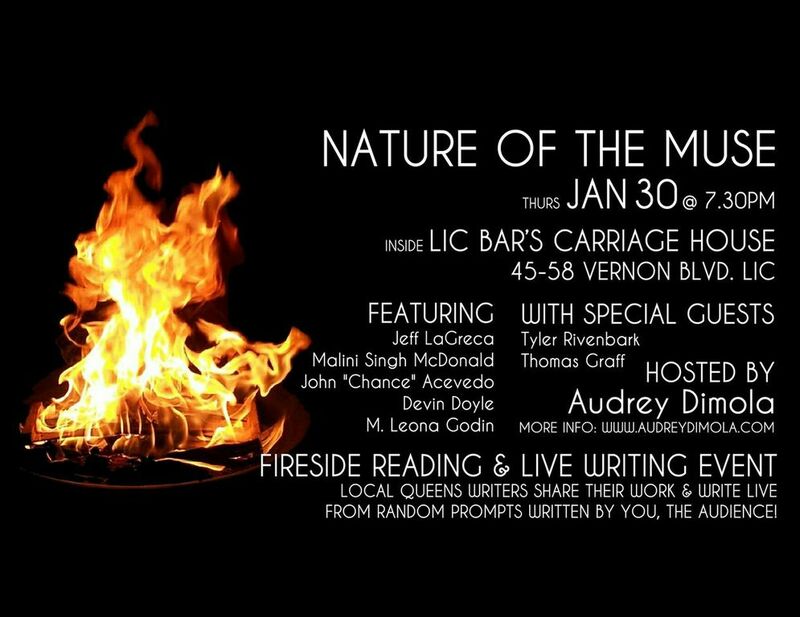 The debut of my reading and live writing event, fireside in the carriage house at LIC Bar! Featuring: Michael Stahl, Sweta Srivastava Vikram, Michael Alpiner, and Carrie Noel, with myself as host and Ace Elijah as special musical guest. View the program here. 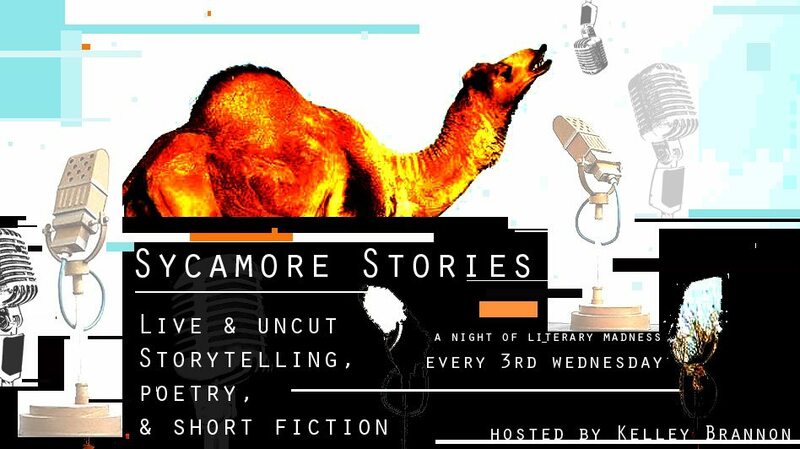 Featuring candid stories, short fiction, and poetry by the talented and insightful: Stella Perry, Dan Combs, Jose Paez, Adam Selbst, Robert Semple, Kate Jones, Eric Nelson, William Spadaro, Raquel Penzo, Audrey Dimola, Kathy Karadza, Alex Clermont, and Moshe Schulman, with your erratic host Kelley Brannon. Sycamore’s FB page is here. The triumphant return of REZ! Featuring Aida Zilelian, Audrey Dimola, Aaron Adler, Deborah Emin, Liza Charlesworth, Justin Martin, Vickie Byron, Alissa Heyman, Enrique Flores-Galbis and Mandy Gor. REZ’s FB page is here. The second edition of my reading and live writing series, Nature of the Muse! Featuring: Aida Zilelian-Silak, Joe Yoga, Tim Fredrick, and Greg Kirkorian, with special guests Siobhan O’Loughlan and Paul Weinfield. Find out more about Nature of the Muse here. Proud to be on the co-hosting team of Boundless with founder Aida Zilelian and Devin Doyle! 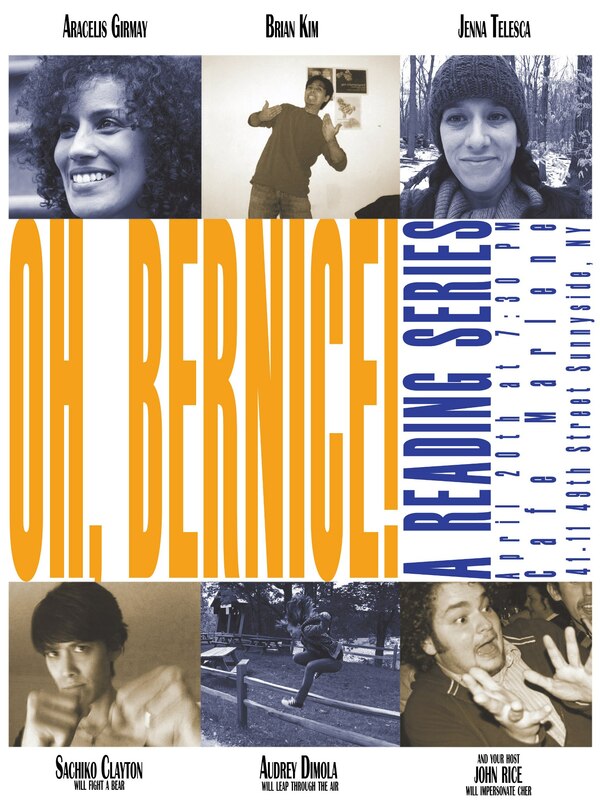 Featuring: Brian Kim, Jenna Telesca, Sachiko Clayton, Audrey Dimola, John Rice as host, and one of the most hilarious event posters I’ve ever seen. 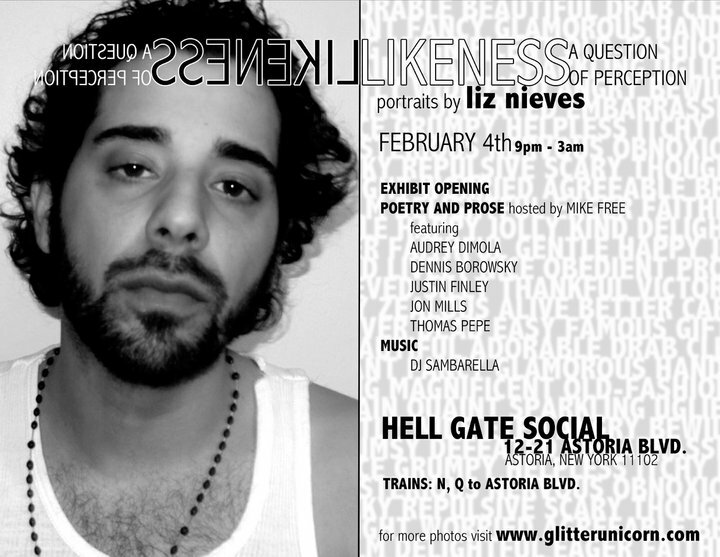 Oh, Bernice’s website is here, and video from my performance that night is here. Reading poetry with LIVE IMPROV CELLO ACCOMPANIMENT! Amazing! Featuring: M. Leona Godin (also fabulous host), Audrey Dimola, Kyle Erickson, and singing cellist Calum Ingram, later accompanied by Sho Handa on drums. FB invite for future events is here. Oh, adventures in outdoor event curating! 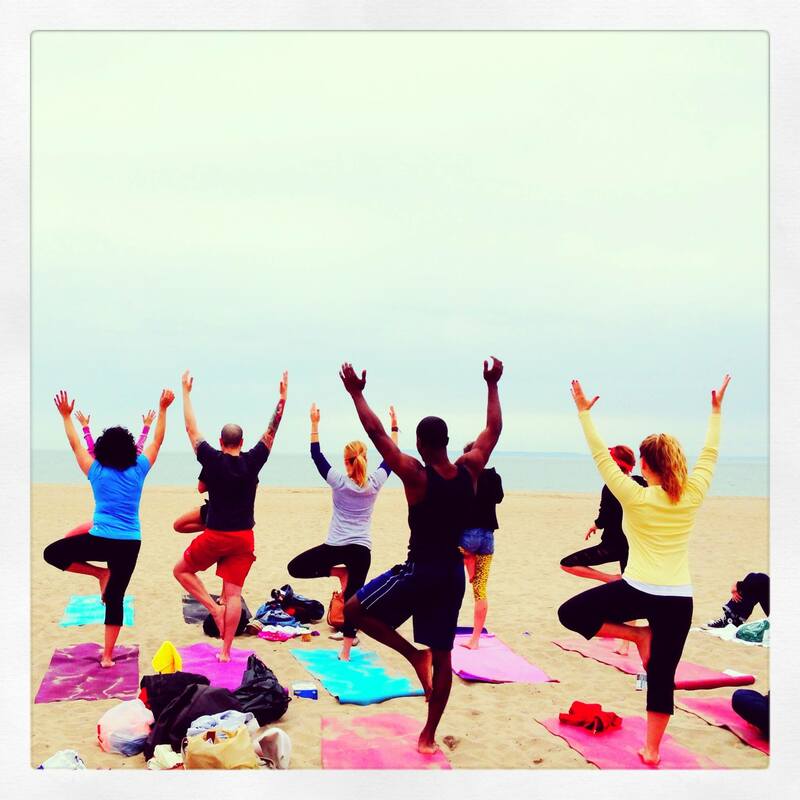 In collaboration with Lola Star – featuring a yoga class on the beach taught by Dina Ivas, readings by Jonathan Fox, Sheila Maldonado, Greg Kirkorian, and Audrey Dimola, with music from SMAX Music and Amy Leo. 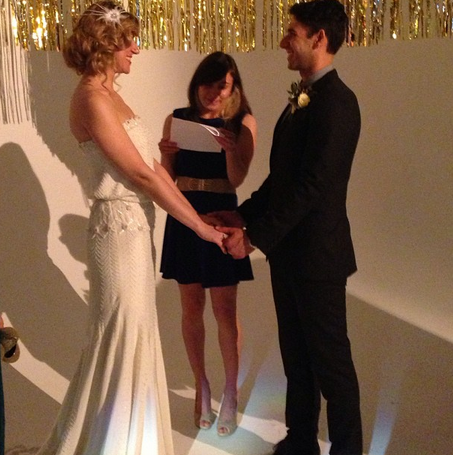 So fun – I faux-officiated a real couple’s vow renewal with some spoken word at the 1st NYC Not Wedding, a bridal show alternative in the form of a big, fake wedding with vendors, food, music, dancing, and more! Reading alongside featured reader Malini Singh McDonald as well as Devin Doyle, Josh Rivedal, and Valerie G. Keane. Reading with Kea DeVay, Aida Zilelian-Silak, Devin Doyle, and Greg Gordon as part of Enigma Bookstore’s soft opening and the debut of Kea’s new spoken word reading series. Representing Astoria’s own Boundless Tales Reading Series alongside Devin Doyle and Lisa Badner at the city’s biggest poetry fest! A clip from my performance is here. Honored to grace their floating stage – the featured writer goes on after the fantastic open mic. First Tuesdays’ FB page is here, and video from my performance that night is here. So very cool to have some of my Instagram photos chosen for inclusion in the 2nd annual Astoria Art Festival‘s Instagram Photo Show! Celebrating Newtown Literary‘s 2nd issue and the opening of Astoria Bookshop with a reading featuring LIC/Astoria writers Jeff Brandt, Audrey Dimola, Carlos Hiraldo, Daniel Damiano, Candice Mays & Jaclyn Majewski. Part performance, part soapbox, and part networking opportunity, the first ever Queens Literary Town Hall brought diverse Queens literary organizations (from bookstores to reading series to festival organizers and more) together with writers and lit lovers to celebrate and strengthen the burgeoning literary community in the borough. Click here for more info, and go here for more info on Queens Council on the Arts’ 3rd Space program. Reading with Elisa Montesinos as part of artist Priscilla Stadler‘s FAVORS project opening reception, meant to “challenge the people of Queens, NYC and beyond to smash the stereotype that New Yorkers are cutthroat, competitive egoists by doing favors for friends, family and strangers”! The 2014 return of my reading/live writing series! Featuring: Jeff LaGreca, M. Leona Godin, Devin Doyle, Malini Singh McDonald, and John “Chance” Acevedo, with special musical guests Tyler Rivenbark and Thomas Graff. Seven writers – Jared Harel, Diane Chang, Rosebud Ben-Oni, Audrey Dimola, Jen Fitzgerald, Becca Klaver and Stephen Krauska – come to together to share their work and discuss what The Year of the Horse means to them. A Q&A will follow. A special poetry and prose reading for artist Nancy Gesimondo’s “Beach Elements” exhibition opening. A recording of the interview is available here. Listen to new and archived episodes on City World Radio – if you’re interested in joining as a woman creative of any discipline, email womenartsalon@gmail.com. Featuring Marc Montfleury, Roya Marsh, Valerie G. Keane, Kevin Marquez, and special musical guests Jeanne Marie Boes and Geoff Ong. Featuring Crystal Rivera, Richard Jeffrey Newman, Jennifer Faylor, Billy Conahan, and Armando Chapelliquen, with special musical guests Samantha Leon and Providence! Conceived by and featuring: Audrey Dimola, Tyler Rivenbark, Jacob Horstmeier, and Kate Vander Velden, with Diana Benigno. On May 9th, the Latimer House in Flushing, Queens will be home to the very first incarnation of “The Wild Papers” as a performance – a unique, site-specific experience in the house and its grounds, conceived with inventor/poet/draftsman Latimer’s spirit of the unconquerable, of innovation and creativity. You will be led through a seamless presentation of vignettes of dreams and memories, told through music, dance, poetry, and theatrical elements both specific and universal, playful and haunting. “The Wild Papers” is an exploration of the joy and poignancy of nostalgia, what we bring with us as we go forward, and what makes us who we are. Selected to work on Public Faculty No. 9 project – conversations about connection – in the field in Queens in conjunction with Queens Museum and visiting artist Jeanne Van Heeswijk. Queens NYC Lit Festival produced by The Inspired Word & co.
A grassroots celebration of literary arts plus music, open mic, vendors, ALL QUEENS BASED! I’ll be hosting some of the open mic on both days & reppin’ my Nature of the Muse reading & live writing series with Michael Stahl, Sweta Vikram, M. Leona Godin, Kevin Marquez & Crystal Rivera performing (Aug 2nd). Featured artist vendor as ART FOR THE WILD with April Tigerlily and Omi Plufs. Known throughout Queens for her explosive poetry, performance, and curatorial work, this is LIC native Audrey Dimola’s first art installation. ‘go slowly, see miracles’ is an immersive amalgam of hidden treasures and alcoves of memories, a cross between a lost boy’s wilderness hideaway, a secret grotto in the mind, and the gritty intersections of love, identity, and nostalgia. It features a variety of never before seen mixed media art pieces, 3D poetry, found objects, sound and visuals, and more- exploring wild spirituality, descents into darkness, reclamation and annunciation. The work is specially presented in this form for LICAO 2016. 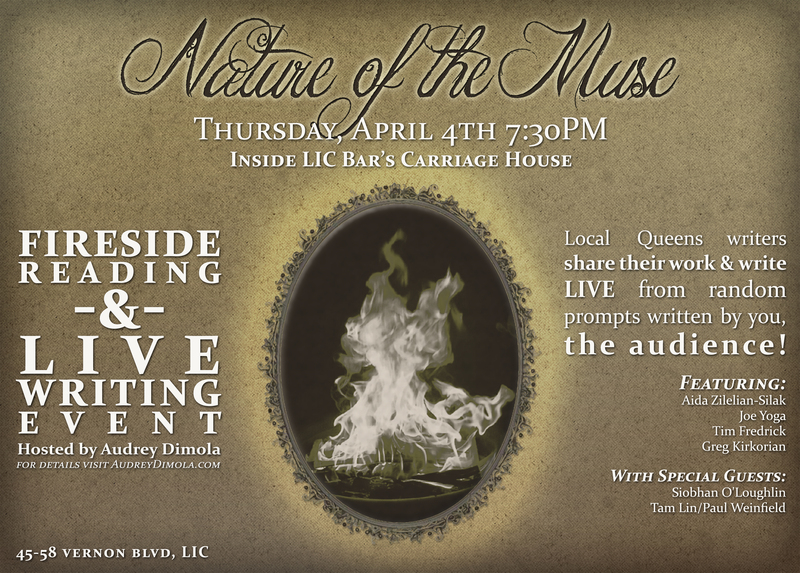 Representing my Nature of the Muse series (& other events) at Inspired Word’s 2nd annual Queens Lit Fest (July 16 & 17th) at LIC Landing, 3:30-4pm with Jack Feldstein, Timothy Bell & Tippy Rex. Speaking on the Taking Poetry to the Streets panel with former Queens Poet Laureate Paolo Javier: Some may think of poetry as a writing style only for the lofty towers of higher education or the upper class, but these poets are taking their talents and love of poetry, and bringing it to everyone. 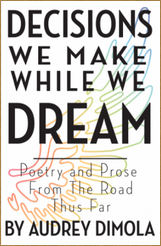 These poets will elaborate on Audre Lorde’s statement, “Poetry is not a luxury. It is a vital necessity for our existence.” How is poetry a “light “in which we can put our hopes and dreams and use it to create change? MY 30th BIRTHDAY CELEBRATION! Poetry, music, mashups, art, rainbowy food & potentially a water balloon fight.. The wildchild from Neverland turns 30, lost boy style! 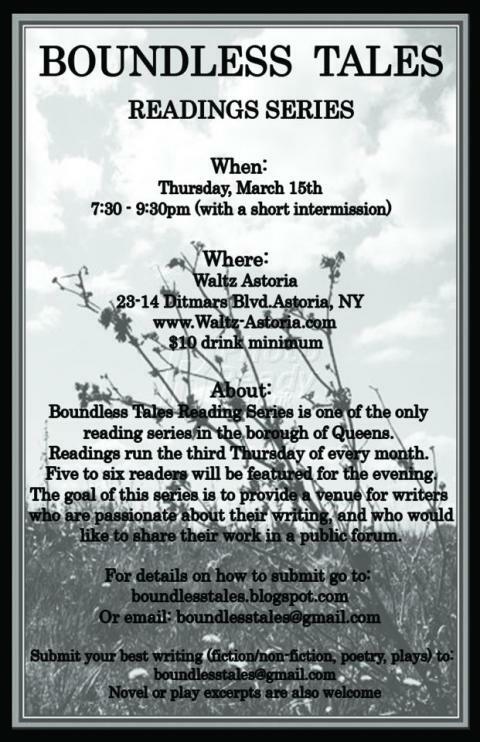 Boundless was the first reading series I read for and also the first reading series to give me a running gig as a host. Join us in celebrating this extra-special milestone! Speaking with the Lewis H. Latimer House Museum about my immersive theatrical experience, THE WILD PAPERS, on the “How to Let Visitors Create Their Own Experience” panel. View the presentation here. One often under-represented group in the process of designing visitor experience are visitors themselves, who are really the core in experiencing cultural institutions. This session explores ways to involve visitors in creating their own experience through unconventional partnerships across cultural institutions, multidisciplinary artists, and community groups. Two projects being discussed here are Light On Sound art installation and Wild Papers theatre, both of which happened at Lewis H. Latimer House. 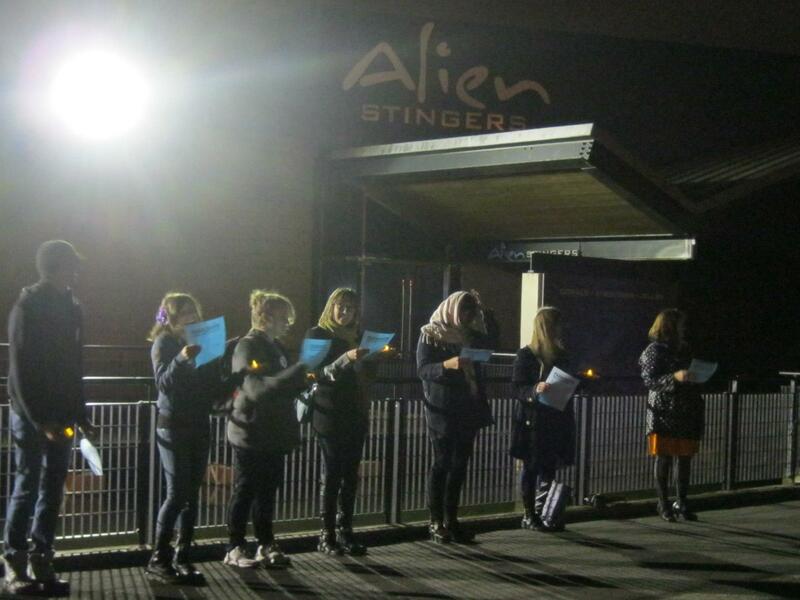 The former incorporates the voice of local residents into an interactive installation, through community poetry workshops. The latter invited the audience to reinterpret the institutional space through a site-specific performance. The session will serve as a trigger for open conversations and collaboration proposals on more innovative ways to engage visitors to create their own cultural experience, either prior to or during their visit, and make a lasting impact on the institution through their experience. Special poetry graffiti installation with sharpie, spray cans, paint, candles, FIRE in THE FIRE ROOM at the LIC-A artists space through Dec 22, plus poetry performance on the opening night. 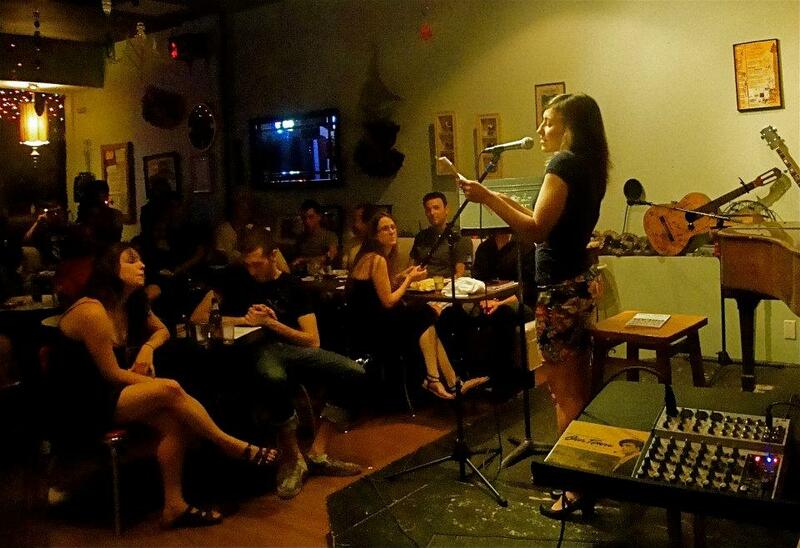 Hosting for Queens’ longest running reading series, Boundless Tales at their new venue The Local NYC! Submit your work if you’d like to read for a future date. PUBLIC PROGRAMS at Socrates Sculpture Park! Featured artist on City World Radio on International Women Artists’ Salon’s Salon Radio program discussing HOW WE CREATE & HOW WE COPE, listen LIVE online at cityworldradio.com, 8-8:55pm EST. *Listen to the recording by clicking “Listen to Archived Shows,” clicking the folder icon, and going to International Women Artists’ Salon 2-2-17. 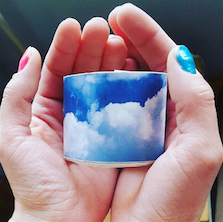 Queens native and poet/curator Audrey Dimola hosts a panel and performance evening aiming for safe space, honest talk, and open presentations about the too-often stigmatized topic of mental illness, particularly in connection to the creative experience. Throughout our cultural history, many of the legendary artists we know today grappled in this way- yet it becomes a passing line in their bio, a tragic footnote; and their brilliant work remains. In the present day, an increasing number of individuals of all ages are struggling in similar fashion, frequently in silence and shame, for fear of judgment and unanswered questions. How much of how we suffer makes us who we are and results in the art we create? How much of these feelings are the natural experience of the artist, and when is it time to seek help? What do those forms of help look like? A variety of local featured artists will present their stories, poetry, music, visual art, and more, in addition to facilitated discussion, Q&A, and sharing of resources/experiences on these topics. All are welcome, your voice is encouraged. Featured guest speaker representing Socrates Sculpture Park and my work as an independent poet/curator for P. Azzarello and J. Pirone’s incredible class on generative spaces and social change at The New School. Featured panelist for the panel on Nasty Women* and Community Engagement and Activism as part of Nasty Women Unite Fest (April 23-30)! Reading original works inspired by paintings! 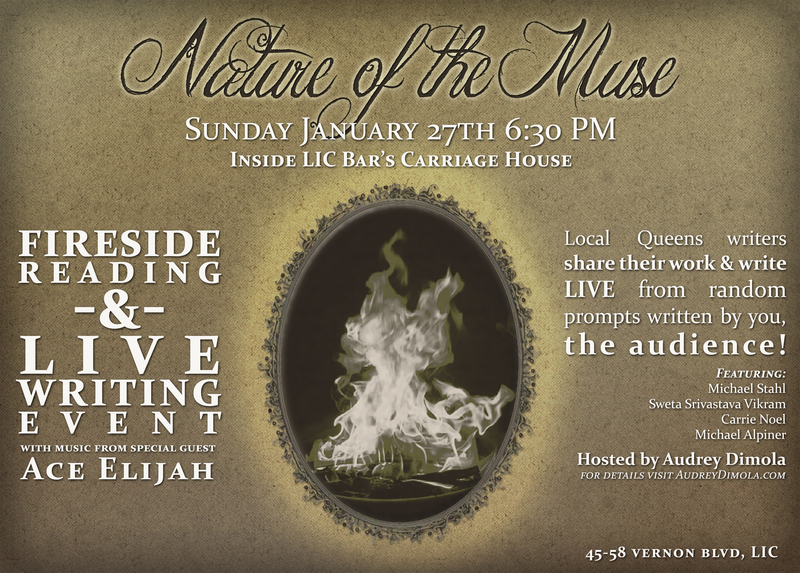 The debut of my show CHURCH OF THE SACRED BODY 5-7pm in the intimate, fireside carriage house at LIC Bar. this show is a call to honoring our bodies, the sacredness in sensuality and sexuality, healing and releasing trauma in our bodies, letting the body speak its truth, uncensored. Site-specific full hallway of poetry graffiti – poem “lazarus was a house on fire (WOMAN)” – and performance included in new exhibition as part of Women’s Month, THEN SHE DID, at the Plaxall Gallery in LIC. Thrilled and honored to return to LaGuardia Performing Arts Center’s ROUGH DRAFT FESTIVAL with the next generation of my show HOW WE CREATE & HOW WE COPE: intersections of art and mental health/mental illness, which originally debuted to a sold out crowd at Queens Council on the Arts in February 2017. How much of how we suffer makes us who we are and results in the art we create? How much of these feelings are the natural experience of the artist, and when is it time to seek help? A multidisciplinary exploration of creativity and mental health/illness. Special reading for “WILDLIGHT” and “Scags at 45” at Kew & Willow Books in Kew Gardens (The Queens Bookshop Initiative’s brick and mortar bookstore!) with my wonderful friend and fellow writer Deborah Emin. I was interviewed by Nancy as part of her Astoria Characters series in August 2018 as “The BFF of Socrates Sculpture Park”! Read the story here. Hosted and curated Volume 1 of NEIGHBORHOOD MIXTAPE, a new poetry, music & comedy show in partnership with Chateau Le Woof! My creative gathering The Widening Circle comes to Communitea in LIC with poetry/music/comedy and community sharing! 6 year anniversary of my first curated/hosted show ever, NATURE OF THE MUSE! In the fireside carriage house at LIC Bar. Celebrated as “a wildfire in a world of fluorescent bulbs,” a “poetic force of nature,” and “inspiration incarnate,” Queens, New York City native AUDREY DIMOLA is a poet, performer, curator, messenger, local arts advocate, community organizer, and lifelong artist, as well as Director of Public Programs at Long Island City’s Socrates Sculpture Park. // Thanks so much for stopping by! You’ll find all my work on this website, past and present, as well as new blog posts. Poetry, prose, videos, events, photos, articles – it’s all here. // STAY WILD, STAY GRATEFUL! Coverage of my work - print, blogs, TV! 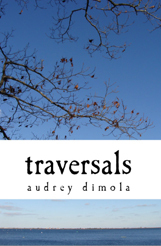 I have three poetry & prose collections for sale, proudly self-published. Like what you read? Support an indie! 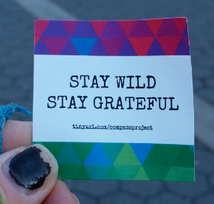 As of February 2012, I've been sticking my Compass Project poetry and prose stickers up around NYC & sending them around the world! Have you seen some? Want some? Find out more! Audrey Light Language – My amazing mom is an energy worker. 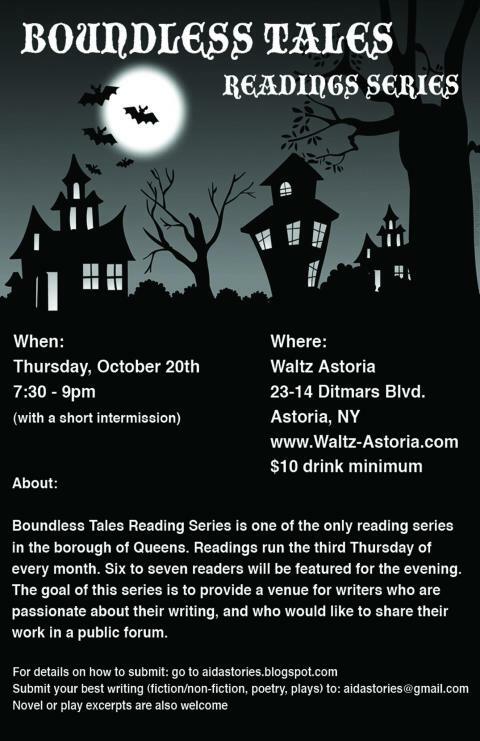 Boundless Tales – Queens’ longest running reading series! Carlos Detres Photography – Portfolio & photo diary of NOLA photog-for-hire. Cesar Bustamante – Queens-born journalist & videographer – class act! Dom & Tom, Inc. – The reason for my project management adventures. Idlewild Magazine – Queens culture guide in print & online. LIC Arts Open – Organization & summer festival celebrating the arts in LIC. 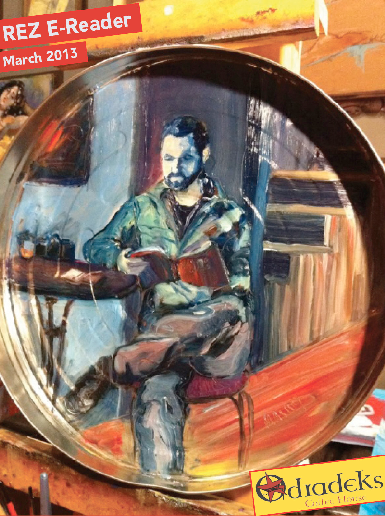 Long Island City Artists (LIC-A) – Amazing org supporting artists living & working in LIC. Newtown Literary – Queens’ own semi-annual literary journal – SUBMIT! Nick Neon – Writer, director, filmmaker, neon revolutionary & my best friend. QNSMADE – Defining the borough of Queens through its people. Queens Council on the Arts – Events, resources & funding for Queens arts. 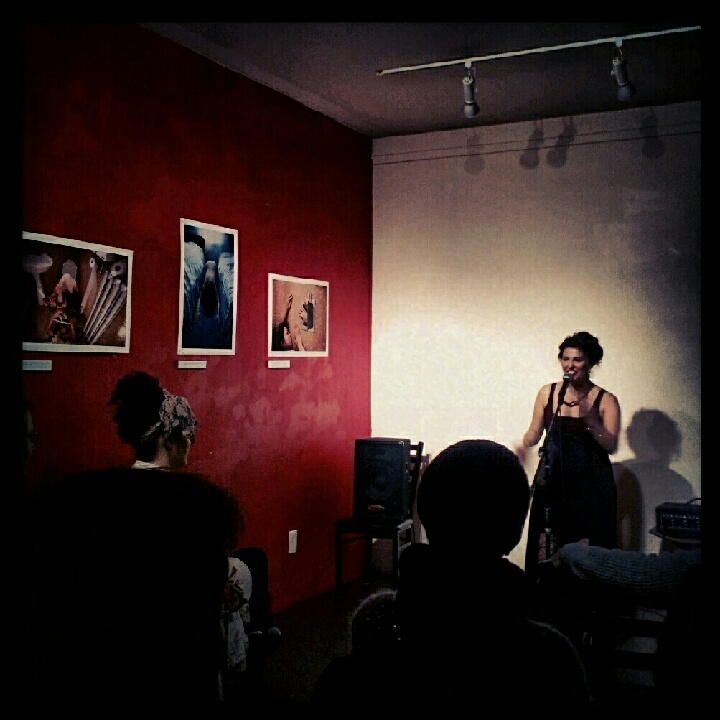 Wendy Angulo Productions – Queens powerhouse writer & curator, founder of Canvas of Words. Instagram – The play-by-play as only photographs can express. LinkedIn Profile – More info on my experience on LinkedIn. 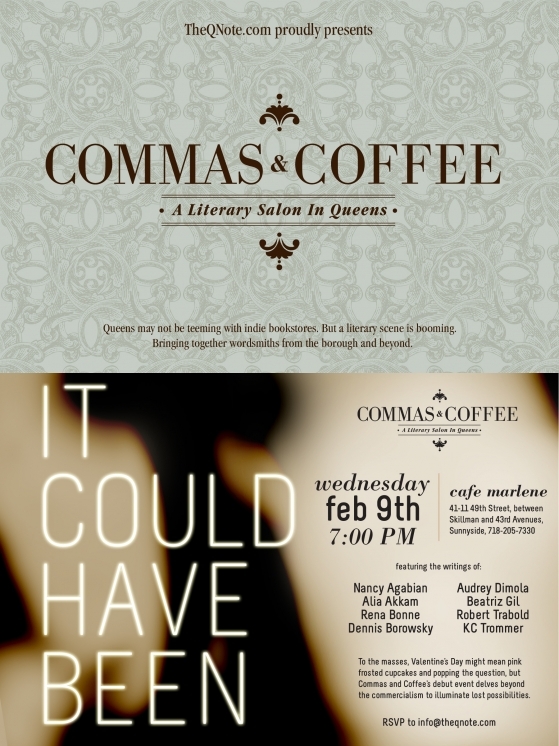 Queens Literary Resources – From reading series to lit-friendly venues! Socrates Sculpture Park – Long Island City’s own wild art wonderland. Twitter – Sometimes, this is still useful.